My interview with the Google series ‘Think with innovators’ looking back over my career and laying out some of the learnings. It brought back some great memories! Yesterday I flew to Madrid for the Festival Inspirational, Spain’s largest digital event run by the IAB in Spain. I was asked by the Spanish team to present their amazing project of The Pool. It was a privilige to be invited as so many great people worked on it in Spain so it was important to try and do it justice. The project has been run over ten months and involved no less than 10 leading advertisers and the same amount of publishers. These were the top three publishers from broadcast, news and the digital pure plays. They all worked together on the project and that was unique in itself, companies that normally work in competition all working together. The great benefit of everyone working together like this was the fact the meetings became a great opportunity for the partners to share and learn from each other. The event itself http://www.festivalinspirational.com was huge with 1800 delegates, a truly inspiring gathering of digital professionals, I was given the last slot before lunch so really wanted to make sure we delivered something succinct and interesting. The presentation contained an overview of The Pool project globally and then focused on the Spanish project. 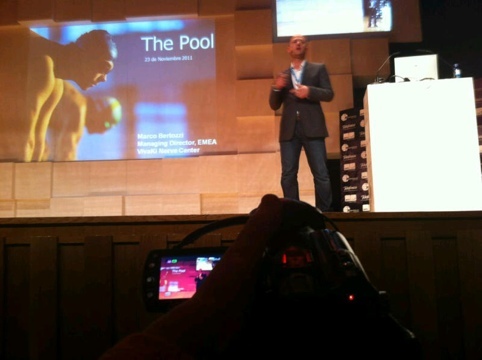 When you see how The Pool can work, it is truly impressive and I look forward to getting the results back from the UK Lane and being able to present in a similar fashion in the UK and hopefully with some support from the IAB..